The rallying cries up and down the halls of marketing today is, “How do we address customer experiences?”----more---- It is if people just woke up to the idea that satisfied customers buy more product, complain less and make good references. 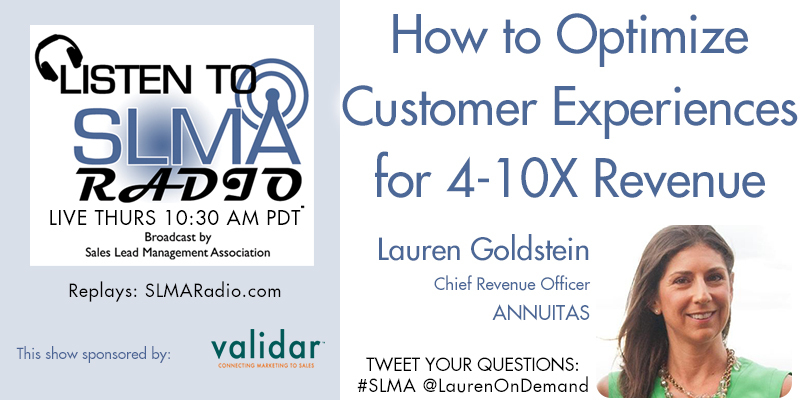 In this program we interview Lauren Goldstein, CRO of Annuitas and we discuss how to solve the customer experience conundrum for a 4-10X gain in revenue. The host is Susan Finch. Lauren serves as the Chief Revenue Officer for ANNUITAS, a Demand Generation innovator. ANNUITAS is a Perpetual Demand Generation innovator – helping marketing and sales leaders plan, build and optimize demand generation initiatives to be buyer-centric, revenue-optimized and always-on. Leveraging the ANNUITAS Demand Process℠ methodology, ANNUITAS clients deliver lead-to-revenue results that are 4-10X industry averages.